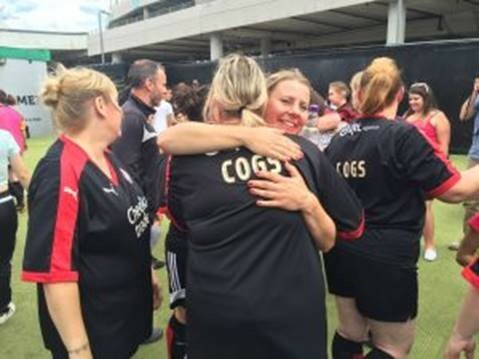 COGs (Crawley Old Girls) only started playing football in April 2015 when Carol Bates, 50, set up the team with the help of the Crawley Town Community Foundation with funding from the EFL Trust Female Football Development scheme. The sessions were developed specifically for older ladies, who have an interest and passion for football, but who may not have had the opportunity to participate before. 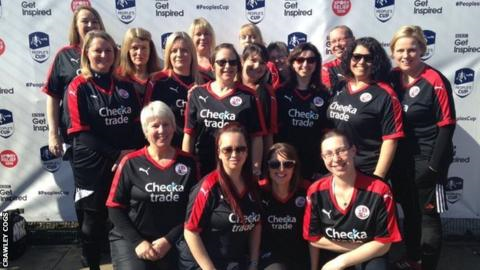 Many of the group are Crawley Town season ticket holders, members of Crawley Town Supporters Alliance, or mums of players from local grassroots clubs. The club started with 10 women who had never played before. They decided to enter the team into the women’s veteran category in the 2016 FA People’s Cup just to have fun. “There was so much excitement and a few nerves,” remembers Carol. “The People’s Cup had an amazing impact on everyone who played in it. “There was a lot of pride in what we had achieved in a short space of time and the sense of camaraderie from everyone made it so enjoyable. The COGs now have more than 50 members and have two weekly sessions (Wednesday for beginners and Thursdays for regulars) to fit everyone in. This year the club is entering three veteran teams and one under-35s team into the 2017 FA People’s Cup, which gives Carol great pride. “My mission in life now is to give older women the opportunity to learn to play football,” she says. “The People’s Cup is an ideal place to enjoy it. 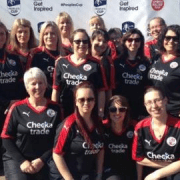 Crawley Old Girls sessions run every Thursday, 6:15pm till 7:15pm at the Checkatrade.com Stadium Ball Court. #2ndHalf: Walking football gathers pace! NUFC Foundation top Kicks participation table!